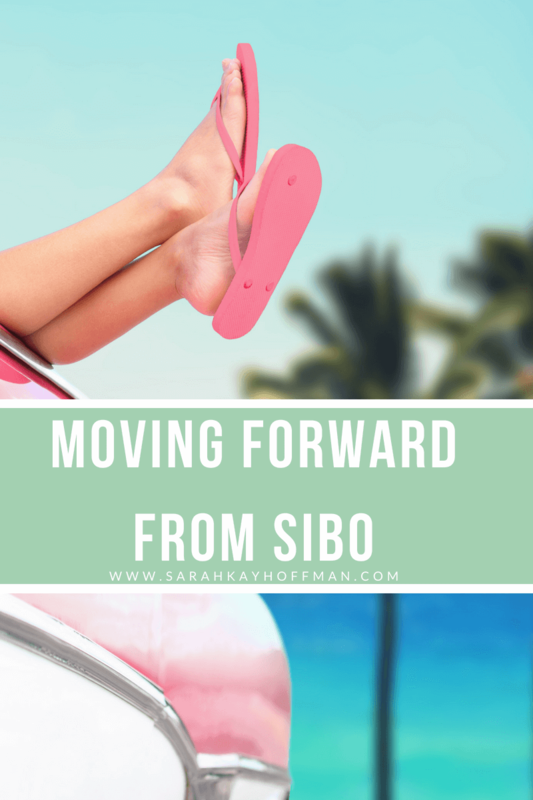 I am moving forward from SIBO, whatever that means and whatever it takes. In the last post I listed out the correlations I made and ‘things I knew for sure’ after carefully reviewing my 28-day journal. This time I will really move forward from SIBO because I am desperate and it’s imperative. Going through these daily motions is not easy or hard compared to anyone else or any other season of our lives. It is only easy or hard compared to the here and now, you and you alone. It brought me to the first thing from my list……the bloat and running correlation. No Running. If you told 10 people they could not run so that they would heal, my guess is 8-10 of them would roll their eyes and say, “Um…okay.” But they are not me; they are also not you. If you love running, I feel ya. On June 2, 2016 I wrote, The Rules of Running. Two years later and I still believe in the words I wrote, but my body via journaling proved to me that right here, right now – me + SIBO – we are just not going to coexist. If I could only tell you how heartbreaking that realization was for me. Remember, my hard in this season; no one else’s. I understand if no one else gets this. I fought the bloat and running realization hard, too. But the signs were all there. So I posed the question (via email) to my new doctor, asking if it could be true that running was keeping me miserable and might prohibit me from ever healing. Here was his response (verbatim), “It has been researched, running causes an oxidative stress in the gut and “LPS” is released and this can be a major reason of bloat and runners diarrhea. It has to do with overtraining as well, so maybe less miles and/or decreased intensity.” I told Michelle. I also told LilliAnne (I’m still paired up with her, though, because you don’t have to run – any workout counts – and I’m not stopping workouts altogether). For the time being I just cut – cold turkey – any and all long distance workouts. I’ve had to get it out of my head that there will be no trail races this summer/fall. Mentally, I made a promise to myself that if I stayed symptom free for a couple-ish months, I could return to some sprints or lighter running 1-2 times per week. No WOD’s. There was also a correlation with intense workouts period (also confirmed by my doctor). Once the correlation with running was made, I refused to see this one, but it was fairly strong and in my face, so I didn’t have a choice. A year ago, an intense 20-minute workout left me feeling strong and energized. This past month, though, the aches and fatigue lingered. Lower back. In 2012, I did a workout program that overused every single part of my body. I am still paying for it today, namely in my lower back. My lower back doesn’t hurt; it’s more like an “itch,” inflammation of sorts. When I used it too much (usually during hard workouts), I always noticed how it would leave me bloated later in the day. There was a direct correlation; one I never saw before. I need to start focusing on strengthening those low-back muscles; they are so weak. So then what am I doing? How am I moving forward from SIBO (without losing my mind – remember, my hard, not yours or anyone else’s). No running + no WOD’s, but that doesn’t mean I’m not working out at all. Not working out is not the solution. Smarter working out is the solution. I’ve gone back to straight lifting where I can focus on making sure my core is super tight to support the lower back at all times. 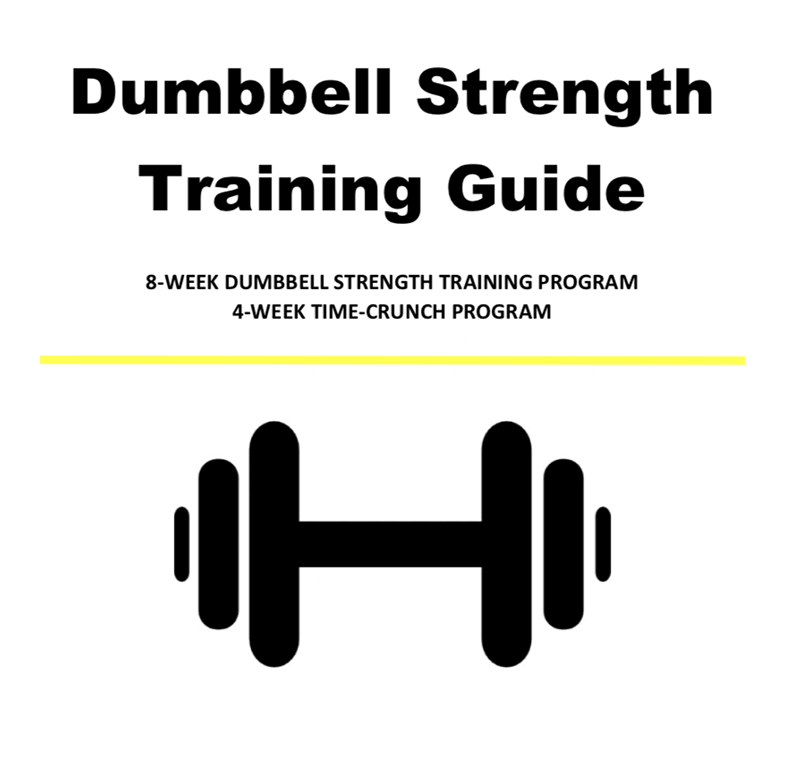 The lifts can be as easy or hard as I want them to be, but right now my goal is to build strength without the addition of anything too intense. I’m doing a Nia Shanks dumbbell program. I’ve been doing it a week already, and I am so grateful for it. In fact, I emailed Nia these exact words, “I love your workouts, and I love what you put into the world. And I just wanted you to know it.” If you’ve never read anything of hers or bought one of her programs, she (like Jess) are top recommendations. I’m already feeling stronger (and am appropriately sore vs. achy sore) without having massive fatigue from it. Low-back focus. In addition to Nia’s program, I am adding in more low back stretches and exercises here and there. I am saving some of them HERE. When I do these workouts and in everyday life in general, I am focusing on my core as much as possible – it’s all connected. Walking x’s infinity. I don’t feel the need to be doing all the cardio, but I do feel the need to walk and move as much as possible without intensity. Walking is probably the best, hands down, form of “cardio” anyone can do. There is research to back it, and it helps with healing efforts for almost every single condition out there. If I’m not shooting during the weekday, I am sitting an awful lot while I work. Getting out to walk is something that must be very intentional. On the days I go lift, I walk for 20-30 minutes on the treadmill. Other days I just take myself outside for an hour-ish. I don’t care what the time commitment is, simply walking right now is critical. Super low-carb and low-FODMAP, but not for long. Tuesday was the first day I’ve had a banana in like 2 weeks. On Monday I had blueberries. I have also been experimenting with a low-carb, low-ish FODMAP 60-second microwave cake recipe, and that uses a tiny bit of almond flour and coconut flour. And yesterday (on the 4th, I had an Epic Bar that had onion and garlic in it – a small amount – but still, along with a ton of low-FODMAP fruits). Outside of those, not a ton of carbs and/or FODMAPs. I have had no bloat. My goal is to stay like this until Italy (except for the day before my Colonoscopy and Endoscopy) and then re-evaluate. 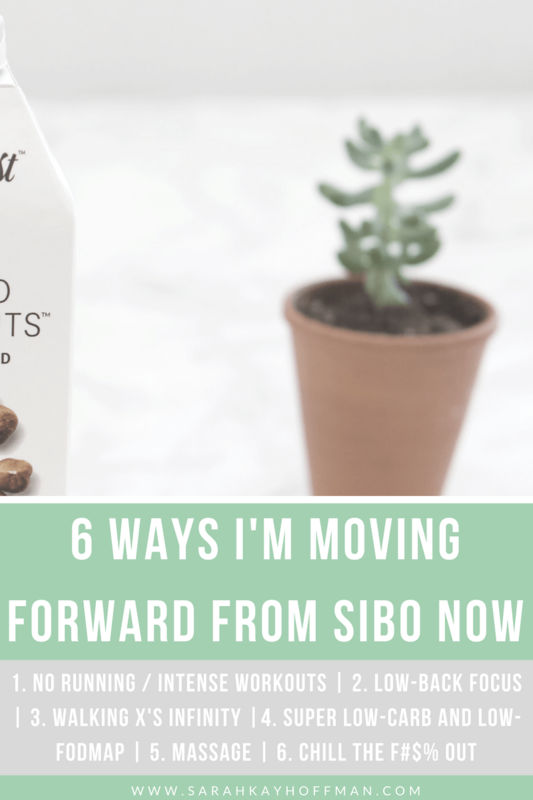 With SIBO, I believe there is a time and place for super strict diet adherence, but I also believe that you must learn to reintroduce foods, at the very least, the “healthy” FODMAP foods like fruits and vegetables. In my experiences, the longer you avoid foods, the more intolerant you can become of them. I absolutely don’t want that; I also want to feel well now, so the balance has me walking a fine line that I’ve perfected. Massages. Maybe it’s me justifying; I don’t care, but I feel like if I have to give up running and certain workouts, some foods, and other things, then I get to add in massages and other lovely self-care things. One night just before I started Rifaximin and Neomycin my low back was so bad and bloat insane that I booked a last-minute massage to see if it would help my body find relief. It was probably the best 60-minute massage ever because the (physical) pressure was taken off my entire core, and I had relief for a couple days. Since then, I’ve been in for another one. My massage girl said that my right side is where all my troubles lie. And that’s where I feel it the most (where all my lower stomach “sloshing” occurs, too), and where I’ve always noticed problems begin. I’m trying to get a massage at least once a month now, if not 2-3. Chill the $%@# out. But for real. There have been so many times during these past few months when I’ve felt bloated to the nth degree, had anxiety like crazy, and then stopped myself dead in those tracks to physically feel myself not breathing. When it all gets to be too much, I’ve been checking my breath, stopping, breathing, breathing some more, and then reminding myself to just chill the @#$% out. I continue to say over-and-over, “You must live life.” And I’m putting it all into practice again. While I don’t like some of the changes I’ve had to make, I refuse to live with SIBO symptoms my entire life. I would rather live life and eat normal food than run a million miles. Find my strength again. I am talking about muscle strength (running took a lot of that away), but I’m also talking about the strength to just do all these things I need to do to get this gone for good. Stay symptom free, and get rid of SIBO for good while proving that this is done, almost entirely, by lifestyle and not diet (because I believe it now more than ever, and no top doctor, nutritionist, or scientist can can help with that). By the way, you should know that I am still 100% symptom free since day 26 of Rifaximin/Neomycin. The bloat is gone (YES, even after the minimal FODMAP foods yesterday and fruit! ), and consequently, the weight is starting to go with it, too. I feel happier, and I feel stronger. I no longer have aches and fatigue (I did, however, need a 3-hour nap yesterday, but the beauty of listening to your body during recovery is that that’s okay). And I’m totally, 1,000% moving forward from SIBO. Whatever it is that plagues you today, I am believing in the same for you. p.s. I get so many emails and DM’s via Instagram about SIBO and healing. If possible (meaning, it’s nothing too private), can you please just leave your questions in the comments below? This way, I can publicly answer so everyone can benefit. With that, grab my e-book HERE (where you’re likely to find most answers) and then ask away for all the other things. I’m here to respond! Finding your blog came just at the right time. I was diagnosed with methane and hydrogen sibo and after the first round the methane went down but the hydrogen went up. My dr said she has seen that before. Have you heard of that happening? Anyway, I did another round of the antibiotics, and retested yesterday. I related to how miserable the lactulose made you feel, as I was bloated and in so much pain for the rest of the day. I am hoping that my hydrogen levels went down , but because of my test symptoms, I’m feeling discouraged. Can you give me some words of encouragement that there is still hope for me? I’m feeling anxious and depressed…. thank you so much! So conforting to know that the numbers could go down even after the test made me so sick. Have you or your readers ever heard of hydrogen numbers going up after methane goes down? Thanks so much for your time with these questions. Bernadette, this happened to me. At my retest after my first round of treatment, my hydrogen went up and methane went down. My doctor explained it like this: in a nutshell, the organisms called arachea that produce methane feed off of hydrogen, and when you kill off those arachea, there are fewer of them around to snack on the hydrogen, so hydrogen goes up. Hope that helps! Love following along with your journey! I am interested in taking another round of Rifaximin (I tried it years ago and it seemed to help). Do you think it will help with IBS-C? My bloating has been so awful lately- it looks like I am pregnant. It’s impacting my mood and causing me great anxiety. I know you mentioned you buy your Rifaximin in Australia- do you know if it is covered at all by insurance in the U.S.? I hope to get it at a reasonable price (but that seems like it is going to be a challenge)! Thanks for sharing your story and for giving people like me, hope. Hi Jess – Thank you so kindly for stopping by. If you have SIBO and it’s methane dominant, which I am assuming with the IBS-C, you likely need Rifaximin + Neomycin. Has your doctor mentioned that? In any case, the Rifaximin is NOT covered in Australia, but I got an entire 28-day supply for less than $300. You would need a doctor’s prescription to get it, though. Good luck! I was diagnosed with SIBO (and later Hashimoto’s and adrenal fatigue) in 2016 during a time when I’d been running a lot, and I had a sense that running was somehow causing some of my problems. I had been training for a spring half marathon, and unlike previous years, I had been building up mileage through the winter instead of taking it easy during the winter. I’m sure there were other things too that all came together to create a perfect storm, so to speak. I loved running. A lot of my friends were through my weekly running group. But running made me feel horrible. The run itself would be fine, but then hours after a run I would sometimes have heart palpitations, feel nauseous and get hot — almost like I was having a panic attack. I knew I had eaten plenty and I was hydrated. I would ask fellow runners, doctors, and staff at the running store about this but nobody had heard of such a thing. It has been a year and a half now since I even tried running. I feel 90% better than I did when I had SIBO, but there’s still a piece of me that isn’t ready to try running again. So now I walk and do yoga. I still meet my weekly running group friends, but now I walk. Usually someone is nursing an injury or recovering from a long race, so someone walks with me. I haven’t even missed running, actually. I did in the beginning but I’ve gotten over it. You might run again, but your health is more important. My functional medicine doctor is not a fan of long distance running and says that anything over about 40 minutes isn’t beneficial, anyway. 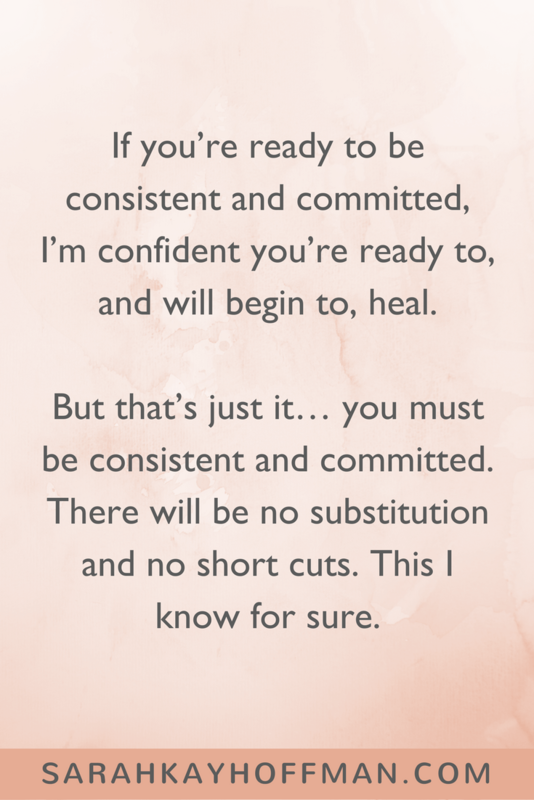 Oh Traci – I NEEDED to hear this this morning. THANK YOU, THANK YOU. Your comment and thoughts are so inspiring. So glad to hear how well you have healed. Keep in touch, okay?! Massages are great because they help your body get into more of a parasympathetic state, so your gut will move. If your body is stuck in a sympathetic mode (all wired as many people tend to be), your gut will tend to run slowly or stop. With SIBO, your motility will be disrupted (either too slow or too fast), so anything you can do to keep the stress down and allow the body to just do its thing is good. 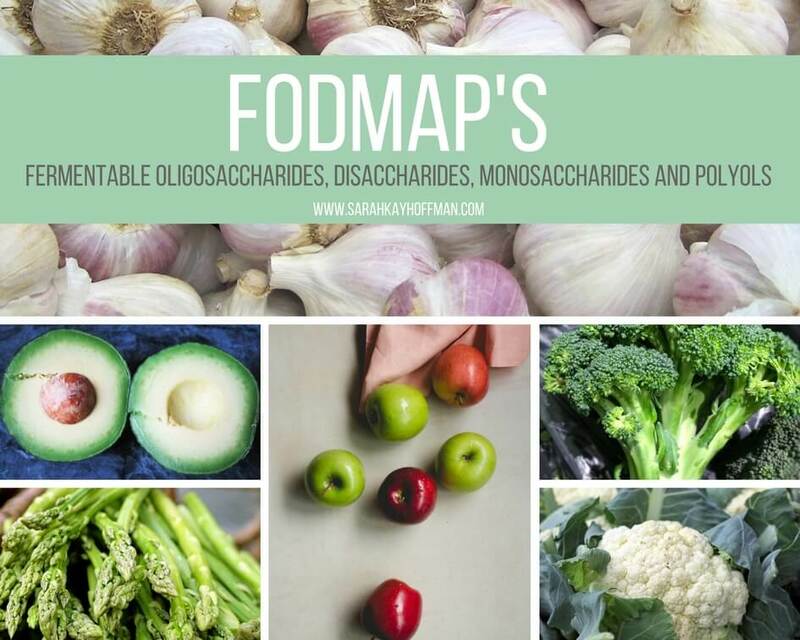 When you were taking your antibiotics, you had mentioned in a previous post about going low FODMAP then trying to incorporate FODMAPS while on your antibiotics. Which do you think helped more???? I’m currently taking CANDIDA SAP (herbal antibiotic) through the advice of my natural path. I take them on and off every two weeks. I notice I don’t have the bloating issues from FODMAPS while taking them, it’s when I stop taking them when FODMAPS cause issues again. I was just diagnosed in November 2018.